There's a reason beyond the routine journalistic negligence for which AP is so well-known why it has ignored this (excuse the pun) bombshell. The AP's own self-congratulatory actions contributed to the situation Podesta tersely acknowledged. In 2013, the AP hid what it knew about the existence of secret discussions between the Obama administration and Iran concerning the latter country's possession and use of nuclear materials. The Obama administration asked a journalist at another outlet and the AP to keep quiet about what they knew — and they did. The AP's Julie Pace went on national TV in November 2013 to revel in how the wire service had kept talks between the U.S. and Iran secret for eight months, leading to what was described then as "The Geneva deal." Perhaps the journalists and management at the wire service believed that they were serving some kind of higher good. Everybody with an ounce of common sense knew that Iran was (and still is) interested in building and using nuclear weapons. So maybe they believed that an agreement between the U.S., Iran and other countries might prevent that, and, ultimately, prevent a war involving the use of nukes which might otherwise have occurred. What's wrong with keeping a secret about something so important? The starry-eyed idealists at AP, if that was indeed their motivation (one shudders when considering other possible motivations), should know now that they were played. Podesta's honesty lays bare the sham nature of the Iran "deal." ... President Barack Obama personally authorized the talks as part of his effort — promised in his first inaugural address — to reach out to a country the State Department designates as the world's most active state sponsor of terrorism. As I wrote at the time: "Translation: They didn't report it until the Obama administration said it would be okay to report it." 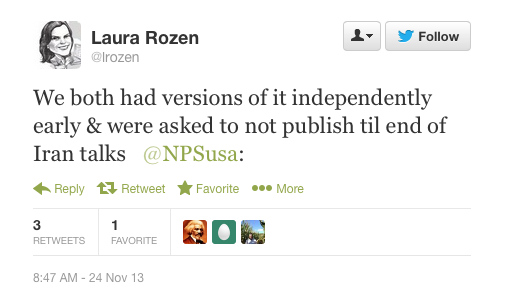 Contrary to a number of accounts since Sunday, AP did not sit on the story for several months. We aggressively pursued the story throughout that period, trying everything we could to get it to the wire. In fact, some of the information we were tipped to in March turned out to be inaccurate. ... The AP routinely seeks and requires more than one source. Stories should be held while attempts are made to reach additional sources for confirmation or elaboration. In rare cases, one source will be sufficient – when material comes from an authoritative figure who provides information so detailed that there is no question of its accuracy. ... if it had been covering any administration other than the current one, AP would have reported that it had evidence that such meetings or talks were or had been taking place, and that administration officials (depending on their actual response) either denied their existence, or would not confirm or deny them. That would have been no different than taking an unsubstantiated claim by a woman who says she was groped by Donald Trump and asking him to confirm or deny it, and making the fallout from the claim and the denial the story. Thus, it should be obvious that the AP's deference to the Obama administration in 2013 in keeping the Iran talks secret had no purpose but to help the administration advance a deeply unpopular agenda. If AP had done its job and indirectly exposed the existence of the talks in the frequently employed manner just described, the blowback would have been intense and bipartisan — and it knows it. Meanwhile, as I wrote, the wire service "deliberately kept their readers, listeners, viewers, subscribing news organizations, and the public they claim to serve in the dark ... and did so at the request of ... the governments involved." As seen in its November 2013 story above, the AP congratulated itself for giving its choice to keep the U.S.-Iran talks secret partial credit for "how the nuclear accord appeared to come together so quickly." 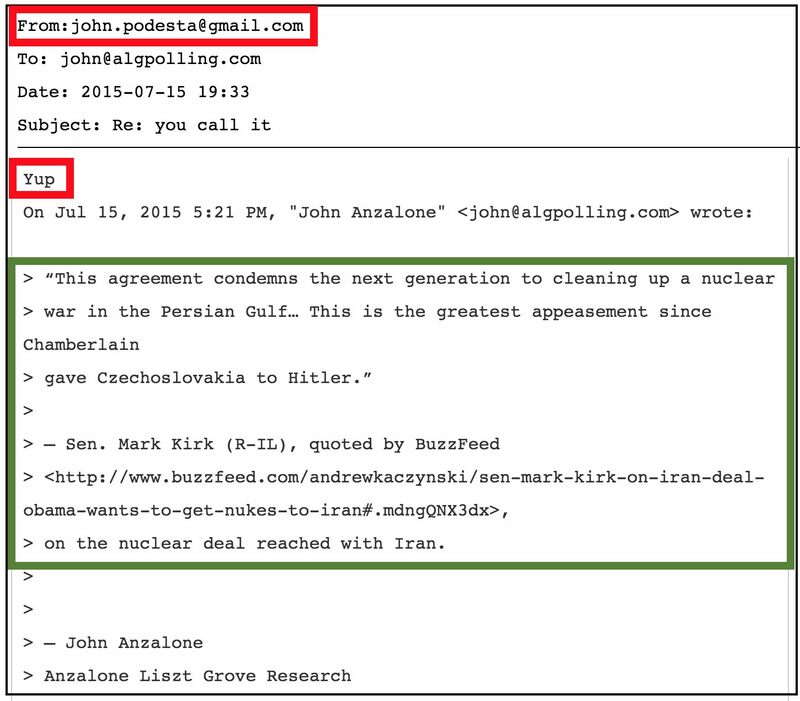 Now that John Podesta has admitted that even people on the left acknowledge the Obama administration's Iran "deal" will lead to "a nuclear war in the Persian Gulf," I expect the AP to take partial credit when Iran begins engaging in nuclear blackmail in the region — and when the bombs fall. Heck of a job, guys.